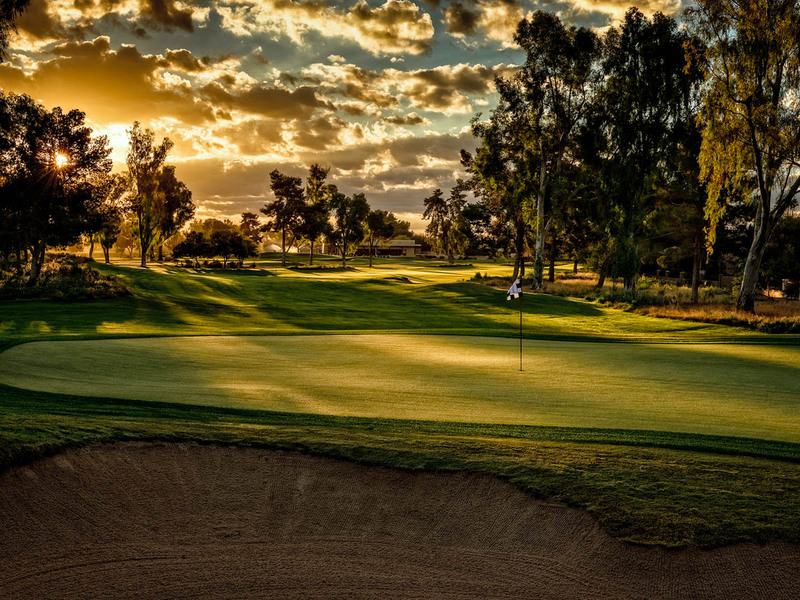 With more than 200 golf courses in the Phoenix area, we live in a golfer’s paradise. At its heart is Scottsdale. Some of the great and unquestionably some of the most scenic holes in golf are right here in our backyard. Of the courses that can be accessed without membership, the cream of the crop is the Ambiente course at Camelback Golf Club. Ambiente is barely a year old, but is already in great shape. Greens are fast and true. Fairways are lush. The vistas are magnificent with backdrops of Camelback Mountain and Mummy Mountain. Every hole on this links style course is encased in flower laden wild areas that are beautiful to look at, but voracious in their hunger for errant shots. The course design is brilliant. Unlike most “resort courses”, this is not one where you stand on every tee box and let it rip into a wide, hazard free fairway. This is a thinking golfer’s course. It’s real golf. You’ve got to manage your game to score well. There’s potential trouble off of every tee box, even the five pars. If you’re the macho type that reflexively grabs driver on every tee box, chances are this course is going bring you to your knees and take your balls. It’s a course for smart golfers. Even off the tee, club selection is an important consideration. The course is playable at all levels, but if you’re not a low handicap golfer, don’t fool yourself into thinking you should be playing the back tees. At 7,225 yards, it will give the best golfers everything they can handle. The 245 yard par three fifteenth is one of Ambiente’s signature holes. From the tips, you’re hitting to a two tiered green with water on two sides, a cavernous bunker on the left and another one in front of the green. The seventh hole is a good par five over 600 yards long. The fourteenth is another par five, but it only plays at 580 yards. The greens are interesting and challenging, but fair. Stay below the hole. Although there is a middle set of tees that bring the course down to 6,630 yards, most golfers will find the “Camel” tees give them all they can handle at 6,123 yards. If you play from this forward tee set and conquer the course, move back to the “Verde” tees the next time you play. But I’m betting you’ll beg for mercy before the course does. It’s still rated at 69.0 with a 124 slope from the forward tees. It’s at 73.9 and 138 from the tips. Ambiente is one of two courses at Camelback Golf Club. Its sister course, Padre, is a fine course in its own right and a good test of golf, but its character is totally different from Ambiente’s. If you’re in Scottsdale for golf, consider playing both courses. 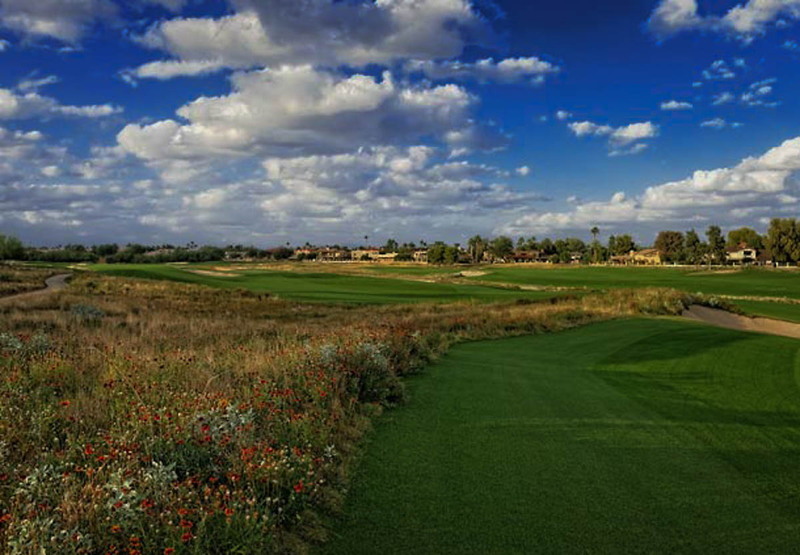 Padre almost has the character of a Florida course while Ambiente is like a walk in Scotland. And you don’t even have to go through airport security to experience the differences. Camelback’s practice facilities, pro-shop and clubhouse are up there with the best of them. The employees are friendly, well-trained and always ready to help. If I were visiting Scottsdale and only had time to play one of its 200 courses, it would be Camelback Ambiente. But I live here and play three or four rounds per week. I still pick Ambiente. It just doesn’t get much better.